Basic Fighter Manoeuvres ( BFM ) are what you use to get your aircraft into a position of advantage while denying the enemy opprtunity to attack you. It's a huge field of study.. and probably the most fascinating aspect of Combat Flight Sims for most fans. F/A-18 Hornet: Korea has excellent in-game video lectures on BFM and the manual contains a substantial chapter by Major David Putze on the subject. It's worth buying the sim for this information alone! 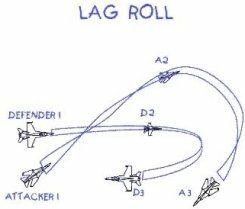 The Lag - Roll manoeuvre.